Straightforward kit brewing is fun and easy, and will generally give you excellent results. However, if you have been brewing beer from kits for a while, you may wonder what else you can do to improve your homebrew even further. In that case, this article is for you. When you buy a beer kit, everything you need is in there. The manufacturer of the beer kit has done all the hard work: selecting the malt and hops, mashing the malt, boiling the wort, adding the hops, and everything else that is involved with this stage of the brewing process, before concentrating the wort and packaging it. While the resulting beer kit is an excellent product, brewing beer from it is a bit like making a pot of soup from a tin: very easy, but you have limited control over the final product. While you cannot change the formulation of the wort concentrate in the beer kit, what you can do is add a little something to it when you brew the beer. Just like you might add extra ingredients to a tin of soup to give your meal more flavour and a personal touch, you can do the same with a beer kit. When the brewer produces the wort that eventually goes into your beer kit, one of the steps in the process is known as mashing. During mashing, malted barley (malt for short) is crushed and then soaked in warm water (typically between 60 and 70°C) for one to one-and-a-half hours. This causes enzymes present in the malted barley to convert the starches in the grain into fermentable sugars. 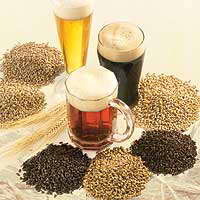 Other than regular malts, which have to be mashed in order to be used for brewing, there are also malt varieties (known as "specialty malts" or "specialty grains" that don't need to be mashed. One example is caramel (a.k.a. crystal) malt, another is roasted malt. These malts have undergone a special kilning process in which the starches are converted to sugars by heat right inside the kernel. As a result, these malts contain more complex sugars, many of which do not ferment, and impart flavour and colour to the beer. Caramel malt, for example, gives your beer a pleasant caramel-like sweetness and a golden to amber colour (depending on the quantity used) while roasted malts (e.g. chocolate or black patent malt) have a deep dark colour and a toasty or even bitter flavour profile. All speciality malts must first be crushed to expose the sugars they contain to the steeping water. Then the grain is steeped in hot water (about 70°C but not hotter) for about half an hour, which leeches the sugars out of the grain. The amount of sugars extracted is mostly a function of steeping time, temperature, the amount of steeping water and the extent to which the grain has been crushed. Under-crushed grain will not yield as much sugar as properly crushed grain. Note that the malt must be crushed but not ground. If the husks are damaged extensively (as occurs in grinding) tannins from the husks will end up in the beer, resulting in an unpleasantly bitter taste. You will also need a sufficient quantity of intact husks to act as a filter medium while flushing the sugary wort out of the grains (a process known as "sparging"). One easy way for the home brewer to sparge the wort out of the grains is to pour the grain-and-water mixture through a strainer and then pour more clean, hot water through the residual grains in the strainer in order to flush out the last of the sugars. The resulting liquid (wort) is usually collected in a large pot, because the next step is to boil the wort for an hour, without a lid on the pot. This accomplishes three important things. Firstly, and most importantly, the "green" (i.e. unboiled) wort contains a lot of undesirable compounds which the grain has leached from the soil while growing. These compounds are volatile and they disappear during the boil. Secondly, the boil sterilizes the wort. Lastly, the heat solidifies proteins from the grain so that they eventually settle to the bottom of the pot (a process known as "hot break"). Should these proteins stay in solution, they would make the beer cloudy and instable. When the boil is complete after about 60 minutes, turn off the heat, put a lid on the pot and cool the wort as quickly as possible. Home brewers often place the pot in a kitchen sink and run cold water into the sink (but not into the pot!) until the wort is cool. An ice bath can also be used. It is important to cool the wort quickly in order to minimize the risk of bacterial infection and to "shock" as many solids out of solution so that they settle to the bottom of the pot. When the wort is at room temperature, take the lid of the pot and pour the contents into the fermenter along with the other ingredients, leaving the trub behind in the pot. The amount and types of grains to steep depend on the recipe that you use, or can be determined by experimentation. If you vary the amounts and types of grain in small steps between brews, you will quickly develop a feel for it. A beer kit contains concentrated wort to which hops have already been added. Alternatively, you can make your own wort, using unhopped malt extract, steeped speciality grains and hops. In this procedure the speciality grains are steeped as described above, using about 15 liters of water. Regular stirring will help to dissolve the sugars from the speciality grains. Remove the grain from the pot using a strainer and add the liquid malt extract. Then bring the wort to a boil. Add the bittering hops as per your recipe and boil for about an hour, adding the aroma or finishing hops later as per your recipe (typically ten minutes or so before the end of the boil). Cool the wort and add it to the fermenter, then proceed as normal. After experimenting with steeped speciality grains, the next level is to mash regular malts (the ones that need mashing and cannot simply be steeped, such as pale malt, Vienna malt and Munich malt) and adding the resulting wort to your beer kit. This process is much like steeping speciality grains, but is a little more critical. When you mash your crushed malt, enzymes in the grain convert the starches in the grain into sugars. This process takes time and can only occur at the right temperature. If the temperature is too low (typically below 60°C) there will be insufficient or no enzyme activity. If the temperature is too high (typically over 70°C) the enzymes are destroyed permanently. The temperature chosen from the range between these two extremes plays an important factor in the character of the resulting beer. Lower temperatures (e.g. 60-65°C) will produce more simple sugars and less complex sugars, resulting in a beer with less body but more alcohol and a low finishing gravity. Higher temperatures (e.g. 65-69°C) will give you a beer with less alcohol but more body, and a higher finishing gravity. When mashing rather than steeping, allow around 90 minutes (instead of just 30) for the process to take place. Keep the temperature between 65 and 70°C (do NOT exceed 70°) for the duration of the mash. Then proceed as with steeped grain. Speciality grains can be added to the mash to add body, sweetness and colour, either immediately or 30 minutes before the end of the mashing process. It is common to add them immediately. The extra steeping time won't affect the extraction of the sugars from the speciality grains significantly. Fermentation can be very simple: you add the yeast to your wort, close your fermenter and you give it some time. The initial fermentation will start, and soon reach its peak. Bubbles of carbon dioxide gas will escape regularly through the airlock, and you know that sugar is being converted into alcohol. This stage of the fermentation is rather vigourous, and practically all the live yeast cells are involved in the process. However, when most of the fermentable sugars have been consumed by the yeast, the activity of the yeast (and therefore the fermentation) begins to slow down. Yeast starts to sink to the bottom of the fermenter, forming a thick, gloopy layer of dead cells, with the still viable but now dormant yeast cells in the top layer of the sediment. Only the yeast cells still in suspension are really active. However, at this point the fermentation is far from complete. It will still take days until the airlock stops bubbling completely. Meanwhile, the dead yeast cells begin to fall apart (a process known as "autolysis" and beging to steep an unpleasant meaty flavour into your beer, reminiscent of Marmite or Bovril. When you brew a regular kit beer this is rarely a problem. Because the starting gravity of a typical kit beer is moderate (around 1.040 or so) fermentation will be complete long before yeast autolysis starts to affect the flavour of the beer. Under normal conditions the beer can be safely left on the yeast sediment for up to three weeks, and a regular kit beer will have completely fermented long before that. Strong ales on the other hand, such as Belgian Tripels, Imperial stouts or barley wines, can take a lot longer to ferment, especially with darker beers containing more complex, slowly fermenting sugars. By the time these beers have completely fermented, yeast autolysis flavours could very well become an issue. The solution to this problem is to transfer the beer to a different fermenter, leaving the yeast behind in the primary fermenter. This process is known as secondary fermentation. The beer is typically transferred after about a week in the primary fermenter. The procedure is simple. Sterilize a second fermenter, as well as any other equipment you plan to use, and transfer the beer to the secondary fermenter. Splash as little as possible to prevent introducing oxygen into the beer (a length of PVC hose pipe attached to the primary fermenter's tap will help) and take care to avoid any chance of bacterial contamination. The bulk of the yeast stays behind in the primary fermenter, while only the active yeast cells suspended in the beer are being transferred along with the beer. Then leave the secondary fermenter for another two to three weeks, or until fermentation (which will now be much slower) has completed. Then add beer finings and bottle as usual. The result of this procedure is a much clearer beer, with a much cleaner and less yeasty taste - in short, a better beer! The use of herbs and spices in beer predates the use of hops by many centuries. In the Middle Ages in Britain, early beers were made with a complex blend of herbs and spices known as "gruit") to help balance some of the sweet malt notes and the often sour or wild yeast flavours and aromas. The gruit blend, often a closely guarded secret, may have included bog myrtle (or sweet gale), yarrow, marsh rosemary, heather, mugwort, sage, horehound, thyme, labrador tea, wormwood, liquorice, ground ivy or even pine resin, in varying quantities and in different combinations. While modern beers are almost exclusively brewed with hops alone, there are many innovative versions which derive unusual and interesting flavours from the addition of spices and herbs. An easy way to get started is to use a (hopped) beer kit as a base, and to experiment with the addition of herbs and spices to give each kit beer its own unique flavour. A wheat beer kit, for example, can be turned into a Belgian style ale by the addition of some crushed coriander seeds and sweet orange peel. A stout can be turned into a festive winter holiday ale by adding cloves, anise, cinnamon or ginger. For more information on brewing with spices and herbs, we recommend Brewing With Spices & Herbs.